I am, and always have been, a breakfast eater. Most of the time, I'm actually hungry come morning, but even if I'm not I eat a little something. This isn't something I've adopted solely because I was interested in food, but more because my body actually needs to eat pretty quickly upon awakening, otherwise I get indescribably grumpy. No matter my circumstances, I've eaten breakfast; I used to crawl out of bed at 3:30 AM, drag myself across the room (to my strategically placed alarm clock), and then stumble in the dark to the kitchen and heat a pot of water to a boil. My rolled oats would be cooked with residual heat by the time I was showered, dressed, and fully awake. The 3:30 AM has since been replaced with 6:30, but breakfast is still first in my mind when my feet hit the floor. I don't claim to have cornered the market on parenting, but one thing I insist upon for my only child is a good breakfast. He may be one of the pickiest children (in my eyes) on Earth, but I can get him to eat breakfast - and we eat it together every morning. After repeatedly reading about the "horrors of breakfast cereals", the grain-heavy diets that will be the doom of us all, and lots of other worthy but somewhat daunting topics relating to a nourished diet, I have long ago ditched the cereal boxes and cook real breakfast foods to start our day. We eat eggs, toast and fruit, sourdough pancakes (which my Kiddo likes to mix himself) and "bear mush" which is essentially brown rice mixed up in the VitaMix, then cooked in my oatmeal pot. Just recently, he discovered he loves French toast, and now asks if I've got the "right kind" of leftover bread to make it with... But one of our favorite breakfasts is made up of just waffles and I've been making variations of the same recipe for more than 2 years. It's never failed once yet! I guess it's my goal: if my picky kid likes something I keep trying to make it the best I can, and in the healthiest way possible. With renewed zeal for sprouting grains recently, I started grinding up different flours to use in our favorite waffle recipe, unsure if he would go for them. This is the child, after all, that told me on Christmas Morning that my sourdough waffles I'd specially started the day before weren't very good. (He was sweet enough to say that the other waffles I make are better, but I still felt pretty bad...) Sprouted flour waffles have won his heart however, and it seems whatever variation I've tried have been met with equal enthusiasm. I have made these with a combination of sprouted flours, with a variety of conventional flours, (they even work with 100% whole wheat) and most recently with nixtamalized corn masa (which is supposedly easier to digest, but I just love the flavor). The base recipe is one of my favorite recipes ever, from Burp! Where Food Happens. Sift or stir dry ingredients together in a bowl. Mix wet ingredients together in a large measuring cup until they are well combined. Pour over dry ingredients, mixing just enough to make sure everything is incorporated. 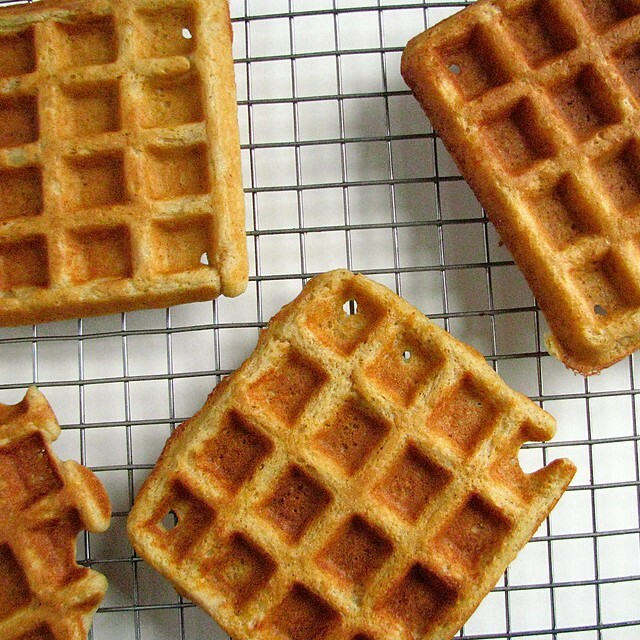 Bake, as you do waffles, in a waffle iron until done. 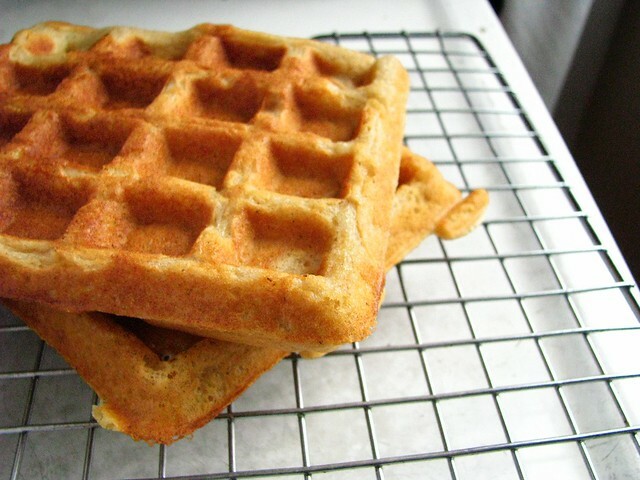 These waffles are maybe not as sturdy as conventional flour waffles, but are surprisingly easy to get from waffler to plate without much trouble. They're even easier to get from plate to mouth. Some flours hold up better than others I've found, but the recipe has good bones so I doubt there is much you could do to ruin it! Considering cooking breakfast generates dishes, it bears noting that even though I make breakfast every day, I seem have everything cleaned up afterwards in no time too. We need to leave our house for school by 8:05, and we rarely eat before 7. Some mornings, I wonder how it is that I've made something nutritious in short order, eaten it and have done all the dishes inside of a half hour. I can't deny that I'm efficient, but I also acknowledge that sometimes we have leftovers that make homemade breakfast a breeze. 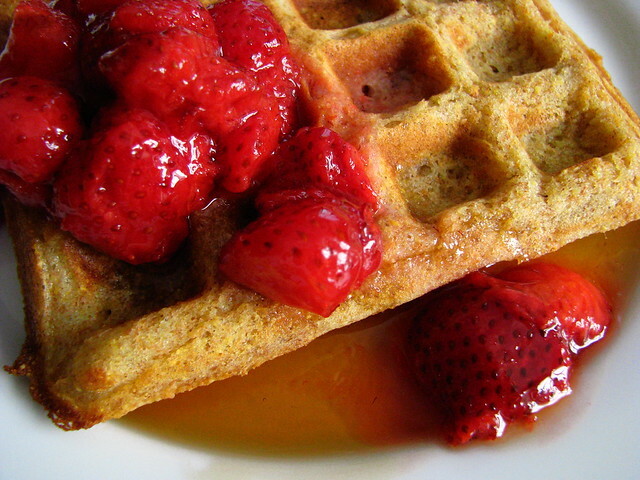 Both waffles and pancakes keep well for a day or two in the fridge, and I even prefer them after a run through the toaster oven. Oatmeals and "bear mushes" take only one pot, and the egg pan just gets wiped clean thanks to the miracle that is cast iron. Toast needs only slicing (and a quick brushing off of the counter if the loaf is crusty sourdough), and fruit only to be washed and sliced. All of these are as therapeutic as an extra ten minutes of sleep, I think. Have I made my case yet for banishing the box of quick and easy cereal? Breakfast really is one of my favorite meals of the day, and I'm confident that my picky eater loves it too. I hope it sets him up for a lifelong love of beginning the day with food. Breaking the overnight fast with nutritious things will hopefully also remind him throughout each day of eating to take care with food choices. 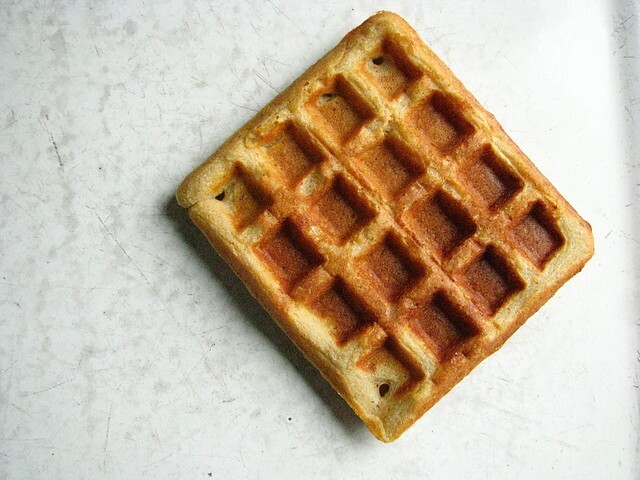 an older pic of a "conventional flour" waffle.